Calle 13 says it better than I can in the band's new song "Multi Viral"
Con aerosol en las calles"
With aerosol in the streets"
This week the battle to keep 5 Pointz from being demolished seems to have been lost after the building's owner, Jerry Wolkoff, had it's beautiful walls painted over with white paint. 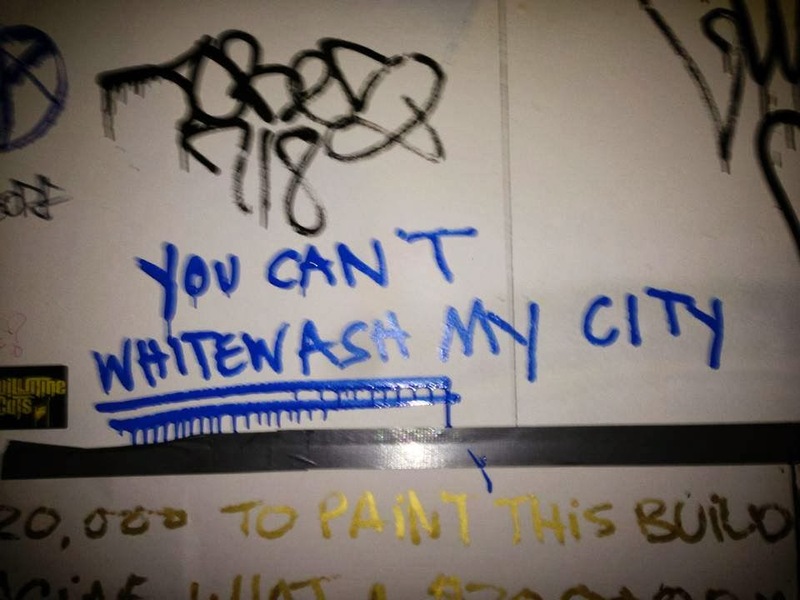 After the incident, I've gotten into some discussions with friends about Wolkoff's right to do this, the meaning of graffiti, and whose side to take. At a glance, it may seem difficult to take sides in this situation because, although 5 Pointz made Long Island City and the ride on the 7 train much better, technically Wolkoff does own the property...Right? In an interview with Daily Intelligencer, Wolkoff almost comes off as a descent man talking about how he allowed artists to paint there, and how the plans for the new building include a 60 foot wall for "them to come in and express themselves". He admits to crying while the building was being painted over with police protection and says that it'll be better for everyone: "I had tears in my eyes while I was doing it. I know it seems like a bitter pill to take, but it's medicine. I didn't like it, but it's going to get me better. It's best for them, and it's best for me." Well, the problem here isn't who is good and who is bad; according to the indoctrinated mindset that most of us grow up in, the factory is his property and he can do whatever he wants. The problem here is that the essential core of that argument supports capitalism and the colonial mindset that we are all brought up in. People own property, and that makes it rightfully theirs despite what others who borrowed that space may have done with it. The 1 percenters have a ton of wealth, and we can't really just take it: we have to work for it. So even if we'd like a piece of that wealth, most of us simply give up and assume that it's just the way it is. But once the process of decolonization and radicalization begins in a person's mind, then the picture becomes clearer. You realize that those owning so much property have generations of wealth accumulated through free labor of slaves, a history of theft and genocide of Native-Americans, and corrupt laws to account for that property. They don't pay the amount of taxes that they should be paying, their wealth continues to grow thanks to our cheap labor, and through the process of gentrification, they are taking over streets that were once ravishing with culture of lower-income communities who have to steal corners of the earth to build their spaces, express their art, and simply be themselves. Once we begin to understand why the rich are rich and the poor are poor, then who-owns-what becomes irrelevant. In an ideal society, communities decide what is best for their communities and a place like 5 Pointz would stay alive. 5 Pointz was more than just a place for folks to paint walls. It was the only museum in New York City that was for the people and by the people. It was one of the only places where artists who cannot afford the privileges that land you in the Metropolitan Museum of Art or the MOMA could have a space to be showcased. Just like Calle 13 said, the media doesn't tell our stories so it is up to us to tell them. And the walls of 5 Pointz may be covered in ugly white paint, but our stories are still hidden beneath. And when those walls fall, with each bang a story of pain and deprivation will be remembered. Those stories will leave a red trail that will forever haunt the two buildings that will replace them. We have to bleed and put our bodies on the line to keep spaces open. Examples of this exist everywhere, at CCNY two students face one year in prison for protesting the closure of the Shakur-Morales Center, also The Rebel Diaz Art Collective was forcefully evicted in February from the old factory where it had found a home. Wolkoff's power over the walls of 5 Pointz are yet another reminder that we must continue fighting for our right to claim back what should be ours. Communities shouldn't be owned when ownership and wealth are in itself privileges that have been denied to lower-income people through cuts to our educational programs, cuts to welfare and public assistance, massive unemployment, systematic racism, mass incarceration, criminalization, and a painful history of oppression. We cannot shine when the means to do so are denied to us. Therefore, we will continue to take these places and put our bodies on the line for them because they mean more than just property. They mean art, love, and an ever-growing passion to heal as a community. Good to read a deeper explanation to what we've spoken about. I may not agree with everything, but I understand the thought process. I liked our discussion, it inspired this post. This is def to be continued.